Toy boxes suddenly started to smell delicious in 1980! Delicious fruity scents of cherry, lemon, raspberry, blueberry, lime and – most of all – strawberry filled our homes. Here was a toy we really didn’t mind buying for our children. The perfume drifted from a series of dolls, of various sizes, who inhabited the ‘World of Strawberry Shortcake’. The most popular sized doll stood five-and-a-half inches tall, was jointed at hip, shoulder and neck, and was made from a hard vinyl. All the dolls had certain characteristics which makes them easily identifiable even today, twenty years later. Their most noticeable feature was their rounded heads, which were slightly larger than they should be, giving the dolls a top-heavy appearance. They all had tiny moulded bumps for noses, and their mouths resembled the letter ‘U’. Each doll had different colour hair, which normally, though not always, gave a clue to the doll’s name. But of course, the most outstanding characteristic of all was the gorgeous perfume. The dolls were marked on the back of their heads ‘American Greetings Corps 1979′, and were made by Kenner. Each doll came with its own little blow-moulded vinyl pet, and they were sold packaged in cellophane-fronted, brightly decorated boxes. The pair cost Â£4.75, which was quite expensive for the time – they weren’t really pocket-money toys. Originally there were twelve dolls in the set; Strawberry Shortcake with Custard Kitten, Huckleberry Pie with Pupcake Puppy, Lime Chiffon with Parfait Parrot, Butter Cookie with Jelly Bear, Raspberry Tart with Rhubarb Monkey, Orange Blossom with Marmalade Butterfly, Cherry Cuddler with Gooseberry Goose, Lemon Meringue with Frappe Frog, Blueberry Muffin with Cheesecake Mouse, Angel Cake with Souffle Skunk, Apple Dumplin’ with Tea Time Turtle and Apricot with Hopsalot Bunny. In addition, there were two slightly larger figures who were the ‘friendly foes’ – Purple Pieman with Berry Bird and Sour Grapes with Dregs Snake. All the dolls were beautifully dressed, and it is difficult today to find them complete, because the tiny garments were so easily mislaid. Socks, tights and shoes, especially, were soon lost, and around 1984 Kenner stopped including shoes with the dolls. The boxes were marked accordingly – so it could well be that if you now find a shoeless Strawberry Shortcake, she didn’t have any in the first place! Th e little socks – the ones which fit the babies are minute – are easy to recognise, as they are green and white striped. Green and white are theme colours throughout the World of Strawberry Shortcake, and crop up several times – such as on Pupcake’s ears. Later, more friends arrived – Almond Tea with Marza Panda, Crepe Suzette with Eclair Poodle, Mint Tulip with Marsh Mallard, Cafe Ole with Burrito Donkey, Plum Puddin’ with Elderberry Owl, Peach Blush with Melonie Belle Lamb and, last but not least, the twins Lem and Ada with Sugar Woofer Dog. There was also a strange, smiling pink and white dinosaur called Fig Boot. Strawberry Shortcake is simple to spot. She has bright red hair, freckles, a floppy hat and a red frock topped with a white pinafore. Today, she is the most commonly found of the dolls, and the one which everyone knows. Angel Cake’s hair is white and curly, and she wears a pale green dress trimmed with white broderie anglaise and a lilac ribbon. Almond Tea has bright purple hair, a lilac trouser suit with yellow floral sleeves and a super yellow flower-shaped hat, while the bespectacled Plum Puddin’s hair is blue, and she is dressed in a pretty purple striped and spotted dress with a spotted hat. The only male doll is Huckleberry Pie, who wears a nifty plastic ‘straw’ hat, and blue dungarees with green and white striped turn-ups. The cute babies are four inches high, and include Apricot, Cherry Cuddler, Apple Dumplin’ and yellow-haired Butter Cookie who is dressed a yellow-flowered white outfit and yellow bonnet. Apple Dumplin’s hair is curly orange, and she wears a yellow romper suit with an apple motif. She also has a yellow mob-cap. Apricot wears a sweet apricot-coloured bib-fronted suit and a hat shaped like a large teacosy, while little Cherry Cuddler has a white dress trimmed with red cherries and a red mob-cap. Perhaps the most unusual of the dolls, harder to recognise as a member of Strawberry Shortcake’s world, is the Purple Pieman. Standing nine inches tall, he has a long narrow face which contrasts with the round heads of the others, moulded purple hair and eyebrows, and, most distinctive of all, an impressive purple moustache, almost three inches across! His purple trousers are moulded onto his skinny legs, and he wears a turquoise top, white apron and floppy chef’s hat. At his waist hangs a yellow ladle, and his Berry Bird clips onto his arm. Purple Pieman is cinnamon scented. The other friendly foe, Sour Grapes, is a thin lady of similar build to the Pieman, with a pointed chin and high arched eyebrows. She wears a long mauve dress decorated with grapes, and has moulded-on lime green gloves. Sour Grapes has purple hair with blue streaks, a pale lilac chiffon scarf, and she wears a pet snake around her neck. Her legs are purple! Many of the dolls were later issued wearing party outfits, which had fuller skirts than than the basic costumes and though for the most part the colouring was the same, these dresses were very pretty with lots of braid, lace and frills. Cafe Ole’s dress, for instance, was orange-patterned, with a pink bodice, white frill at the hem trimmed with pink ric-rac braid and edged with green lace. She had a matching hat. In addition, a selection of clothes were sold separately; each pack included an outfit for the doll and a matching one for the pet, and amongst them was nightwear, rainwear, a track suit, ballet dress, beach dress and dungarees. Strawberry Shortcake also came as a ballet dancer wearing a strawberry-trimmed tutu, pink and white striped tights and her trade-mark hat. She was sold complete with a ballet barre attached to a green mirrored stand. Plenty of accessories were produced for these sweet little dolls, for instance a spectacular white house with a red roof. Gaily-decorated shutters fitted the windows, and it had a window box, veranda and sw ing. A range of furniture was available too, all of it in bright, primary colours. 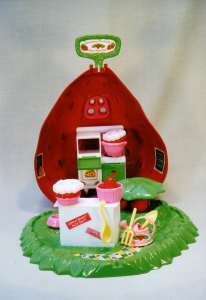 The Berry Bake Shoppe, shaped like a large strawberry, contained a cooker, table, bowls and a magic pop-up strawberry patch, while the the Garden House consisted of a delicate gazebo made from white plastic trellis, complete with cupboards, chairs, hammocks and a barbeque. Some of these products, together with the dolls, were re-released in the early 1990s. Strawberry Shortcake and her pals could ride upon the Berry-Cycle, a trike with pink wheels, green frame and a yellow carrier for Strawberry’s pet cat, Custard, or they could hitch a lift on Flitter-bit, the two-seater yellow butterfly. He could really flutter his green wings. There was a strawberry on wheels called the Big Berry Trolley, capable of carrying several dolls at once, a pony called Maple Stirrup who pulled the pink and green Oatsmobile cart, and a stern-faced Berry Merry Worm, who didn’t look merry at all. He was an orange, articulated caterpillar equipped with a seat for one doll and a pet carrier. The dolls could also be fitted into a large red strawberry-shaped carry case, which was useful for storage. 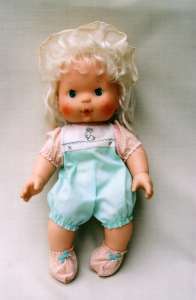 Some of the prettiest, and most original, of the Strawberry Shortcake dolls were the ‘blow kiss babies’. These fourteen inch, soft-bodied dolls had vinyl heads, arms and legs. They had very sweet faces with painted eyes and freckles, and their hair was fine and silky. When you squeezed their tummies, they blew a scented kiss! Each doll was dressed in a patterned romper suit with booties and a mob-cap. Not all the characters were available in this large size – as well as Strawberry Shortcake, you could get Lemon Meringue, Apricot, Angel Cake, Orange Blossom, and the strange-sounding ‘Baby-Needs-A-Name’. These dolls were expensive when they first appeared – Hamleys sold them for Â£24 in 1984. 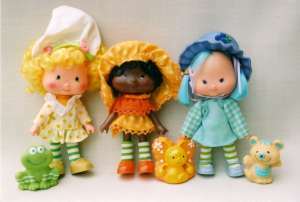 Palitoy produced a series of rag dolls featuring Strawberry Shortcake and her friends. These attractive and colourful dolls, fifteen inches tall, were child friendly, because not only were they soft and cuddly, they were machine-washable. Their hair was made from wool and they could be undressed. 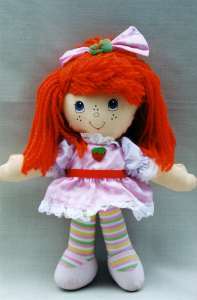 When Strawberry Shortcake reappeared in the early 1990s, a totally updated 13″ rag doll was issued by Those Characters From Cleveland. The face had been altered, and the clothing modernised, while the famous green-striped stockings had pink and yellow stripes as well. Although pretty, somehow, Strawberry Shortcake had lost her innocent charm, and was now just another doll. 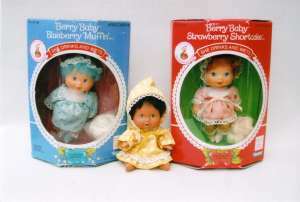 Berry Babies were a cute range of small drink-and-wet dolls which came complete with feeding bottles. Buggys and bassinets were also made to fit these little babies, but unfortunately, like so many of the rarer Strawberry Shortcake items and dolls, they were mainly available in the States, though some were sold through independent outlets in Britain. 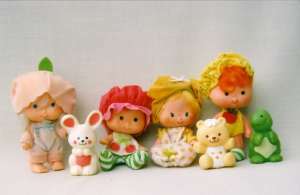 Strawberry Shortcake characters were also made as two-inch high moulded vinyl figures which depicted them in various situations such as picking flowers or dancing. Accessories such as houses, shops and vehicles were made to accompany them. In addition, a range of adorable plush pets were produced, each bearing a Strawberry Shortcake logo on their collars. Today, many people collect the World of Strawberry Shortcake, and amazingly the majority of the dolls have managed to retain their perfume. So, if you fancy a collection of colourful little dolls which will do duty as room-fresheners, why not invest in a punnet of Strawberry Shortcakes?